We're moving from an old sui generis build process to using gradle. I'm a big fan of IntelliJ, but the gradle integration is really, I guess, not up to the quality I've come to expect from IntelliJ development. The Gradle Tasks window shows the tasks well enough, but there's no equivalent display to the dependencies list in the Maven Projects view, which is very handy. On top of this, I've reported an issue when you try to import Gradle build files (http://youtrack.jetbrains.com/issue/IDEA-122323). Is it just me? 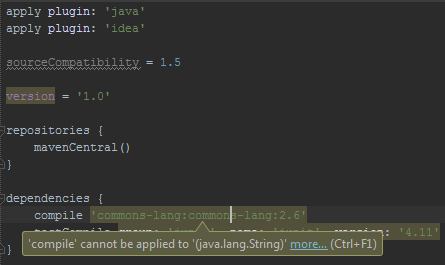 Is anyone else having the kind of trouble working with Gradle files in IntelliJ that I'm having? 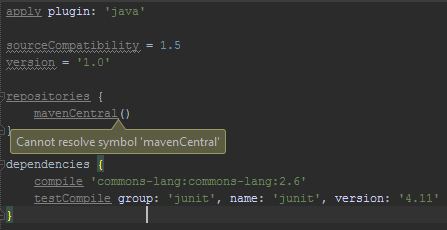 I'd really like the Gradle DSL to be fully supported so that I can type "tar", hit Ctrl-Enter, and see "targetCompatibility" as a suggested completion. That is not happening now. Or is this a Gradle version issue? If so, fine I can roll to whatever Gradle version is supported, but I can't find this documented anywhere. If there is a dependence on some particular version, that ought to be a little clearer. Anyway, any help on getting this stuff working better would be greatly appreciated and I'm more than willing to do whatever I can to help understand these problems. But at least from my viewpoint here, it's making me nervous about doing this level of development without full support from our toolkit. I am facing the same issue. Have got a solution or answer for that? Could you please attach screenshot of "Settings/Preferences | Build, Execution, Deployment | Build Tools | Gradle" menu? By the way, dependencies are shown inside source sets.